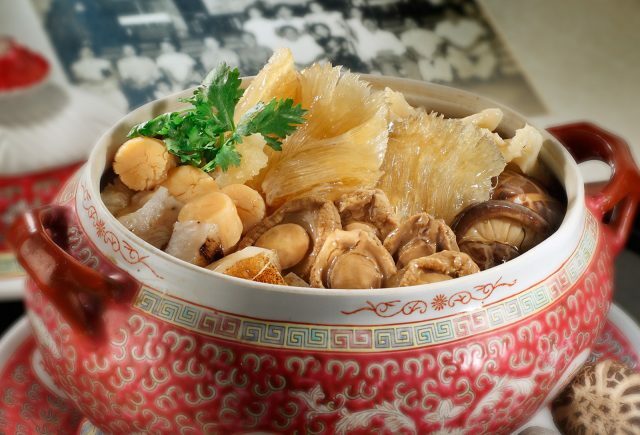 Also known as Buddha’s Temptation, this shark fin soup was originally created in Fujian Province during the Qing dynasty and is considered a Chinese delicacy revered for its rich taste and high-end ingredients. Made from a blend of shark fin, quails eggs, scallops, sea cucumber, abalone, chicken, ham, pork, mushrooms and ginseng, the soup, which takes two days to prepare, gets its name from allegedly being so tasty that it would entice vegetarian monks to flee from their temples to enjoy the fishy, meaty concoction. The soup is controversial due to its inclusion of shark fin and abalone. Fine dining French restaurant Kai in Mayfair got its version of the soup into the record books when it listed the delicacy for £108 a bowl on its menu in 2005. The dish, which had to be ordered five days in advance, has since been taken off the menu due to controversy surrounding shark’s fin.